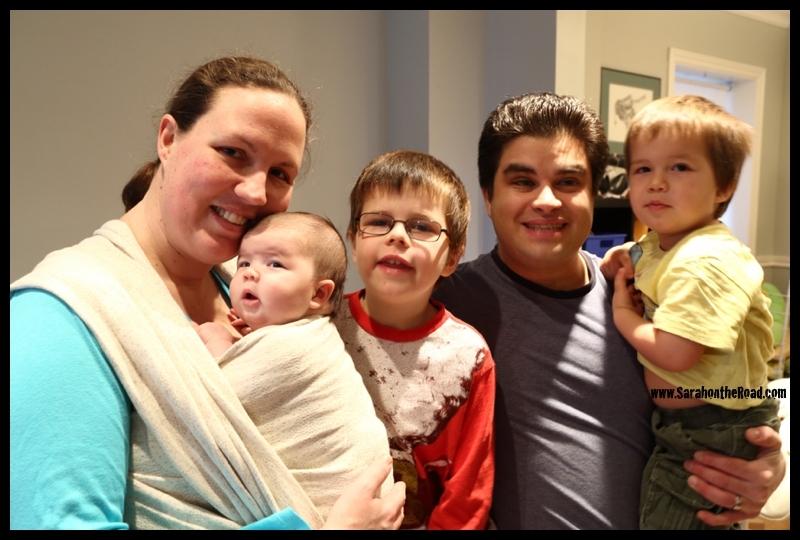 My really good friends welcomed a daughter into their family this past fall and became a Party of FIVE! In December I visited their home in Toronto and met the newest addition. Over the past few years I’ve been able to take photos of their family documenting the changes that have happened. The last photo shoot we did was in June just before they moved south from Iqaluit. This photo shoot was just a quick one done at their house, inside because of the winter weather outside! 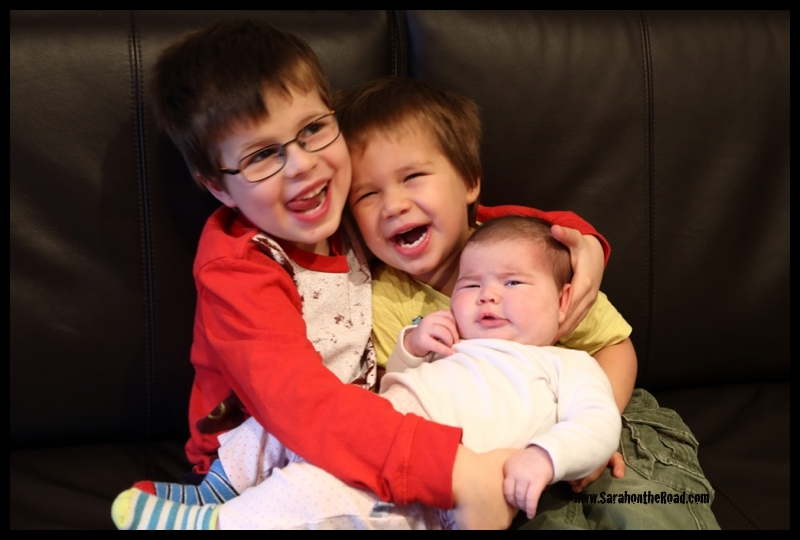 Big brothers are clearly very happy to welcome their little sister into the family! Baby Sofia is just the cutest little baby ever. She was 8 weeks old and so cuddly. 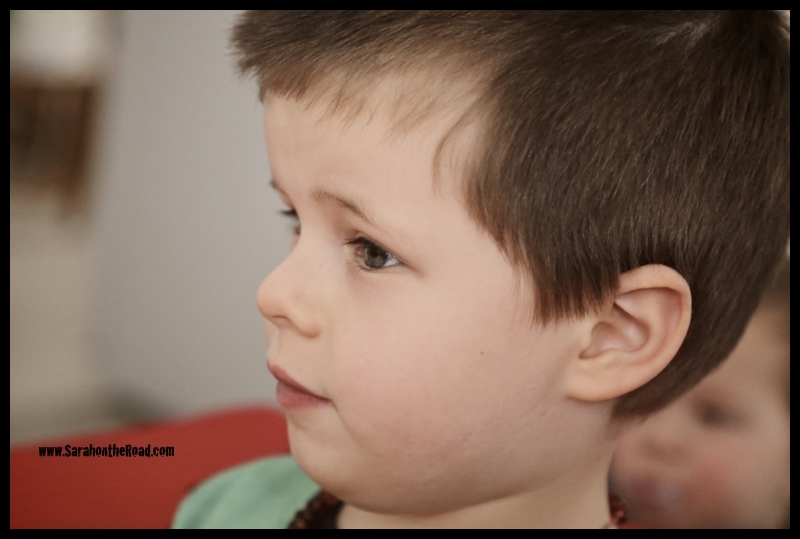 I can’t believe how much the boys have changed and grown in the 6months since I last saw them….why do kids grow so fast? 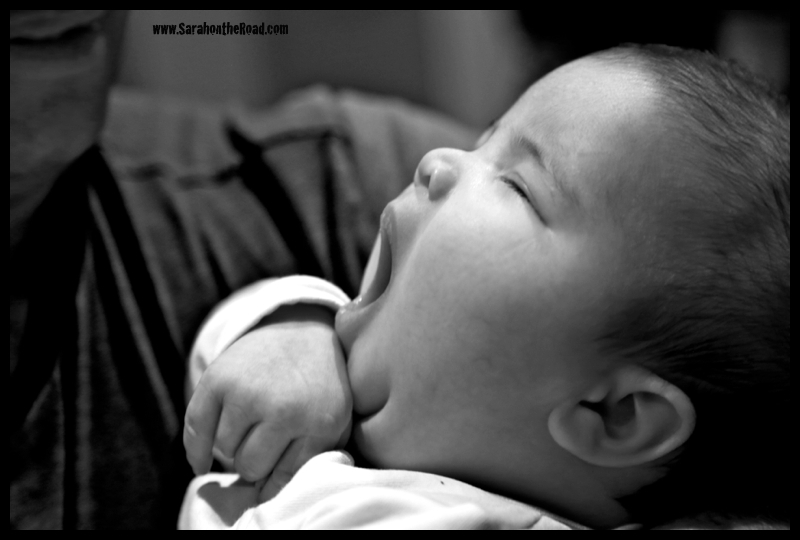 Sometimes I wish I could just press the pause button…so life could slow down a bit. It was so great to visit your family in Toronto. I can’t wait to see you next time I’m in town…hopefully the weather will be warmer, so we can enjoy some of the great parks near your neighbourhood! 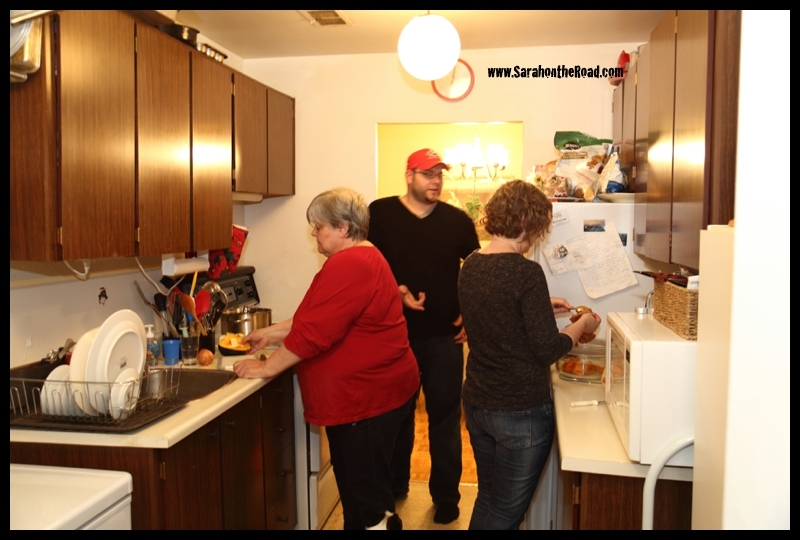 This entry was posted in Friends, Photography, Visits to Ontario on January 16, 2015 by Sarah on the Road. Christmas Day was a fabulous day! It was so fun being with my family this year..after spending last year with my Northern Family in Nunavut. 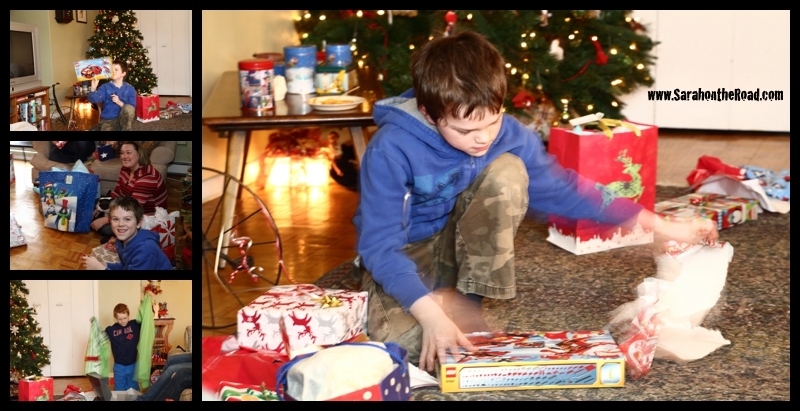 My nephews did the big job of delivering the presents to everyone. We decided to deliver all the gifts to everyone, then go from youngest to oldest opening one present at a time. 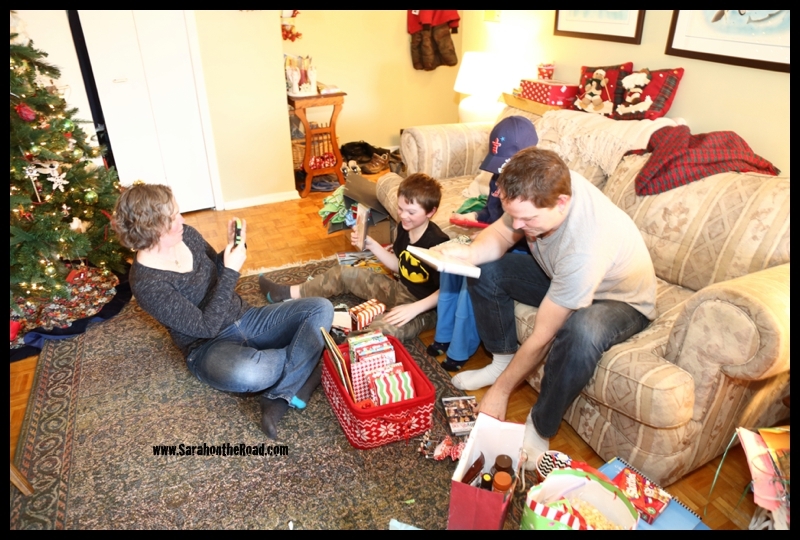 It was a great way to do the gift opening…but did take a bit more time than we thought! I can’t believe how BIG my nephews have gotten…at 8 1/2 and 6 1/2…they aren’t little babies/ little kids anymore–when did they grow up!? 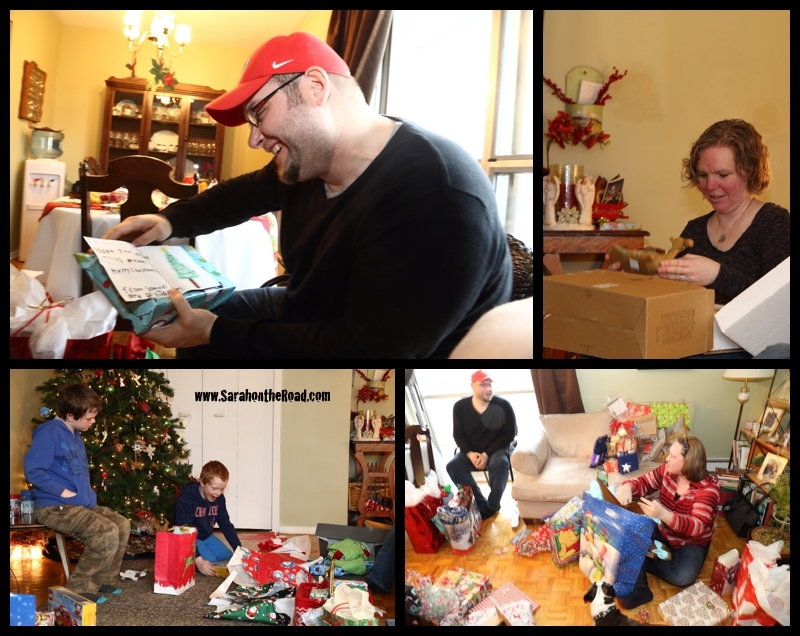 There were a few awesome surprises that were opened! Some were ‘gag’ gifts…and others were just really cool and thoughtful gifts. (I *might* have gifted a HUGE metal star to John and Kat…because they just ‘love’ them, and think that every house in Lindsay needs one. There were discussions that said Blue Metal Star would have to rotate around the family…having a minimum of a 3month stay at each family members house before it is ‘re-gifted’!) Ahhhh i love starting new fun family traditions! Santa brought everyone PJs…matching ones for my sis-in-laws and I! Another really cool gift was a ’12 days of Christmas’ gift…with 24 different Christmas movies (one kid & one adult movie for each day)…to enjoy as a family over the next days of the Christmas season. After the presents were opened there was some serious lego building…and looking at the Photo Books I made for Mum and John & Kat of our trips we did together this year. I have a love-hate relationship with my mum’s kitchen…it’s just so small, limited work surfaces… I stuffed the turkey and got it in the oven..so my kitchen duty was early, and it was just me in there. Then Jamie & Dana and John and sometimes my mum… joined in for doing the sides! There was some serious fun going on in there—but also some seriously awesome cooking… but I haven’t heard my brothers laughing like that in years, kind of fun. I returned to the kitchen on dish duty with Kat! 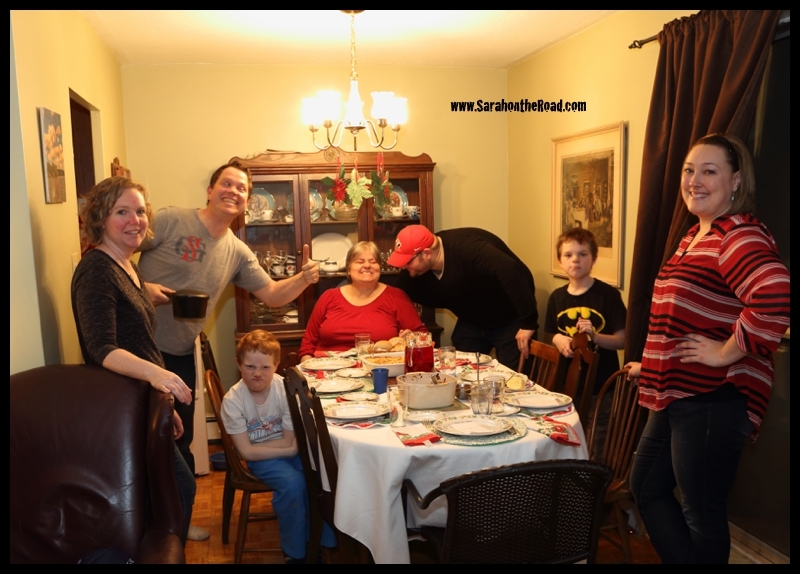 Yes, this is my crazy family…but love them to bits, even though sometimes we have differences of opinions…I wouldn’t trade anyone for another in this crazy bunch! I was introduced to a new grace at dinner…but really didn’t feel like putting up my ‘shark’ fin. I’ve always said I’m not a dog person at all. But I do love other peoples dogs (just don’t think I’ll ever get one of my own..) Gus is John and Kat’s baby… and was dressed up in a new Christmas sweater when he arrived! So cute. Yesterday, my mum and I went to my Gramma and Bart’s house to bring them some Christmas gifts from our family. (They spent Christmas day with my Aunt and Uncle!) 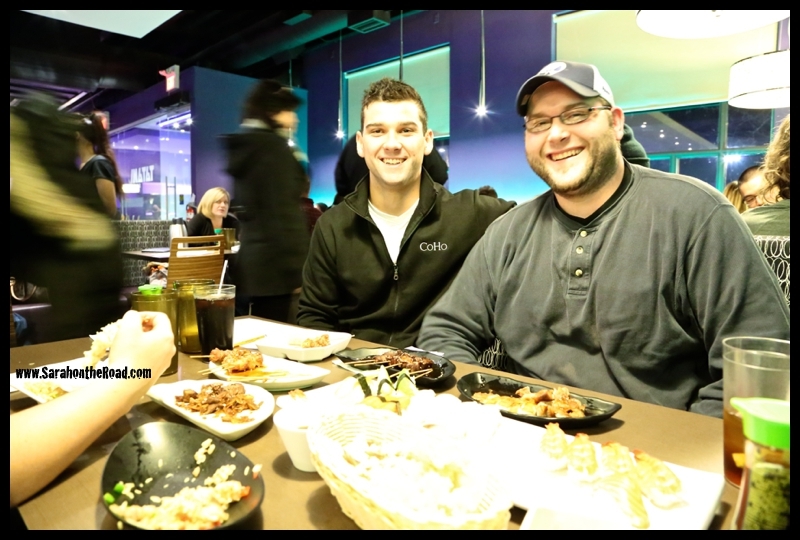 It was great visiting with them…and catching up! I didn’t take many photos…but have these of the gift John and Kat gave to them, it’s a pretty cool photo collage! So that wraps up my Christmas happenings with my family…other than sleeping in and watching Christmas movies…all in all it’s been a fabulous Christmas! I hope you all have had a fabulous time surrounded by those you love…doing the things you love to do. 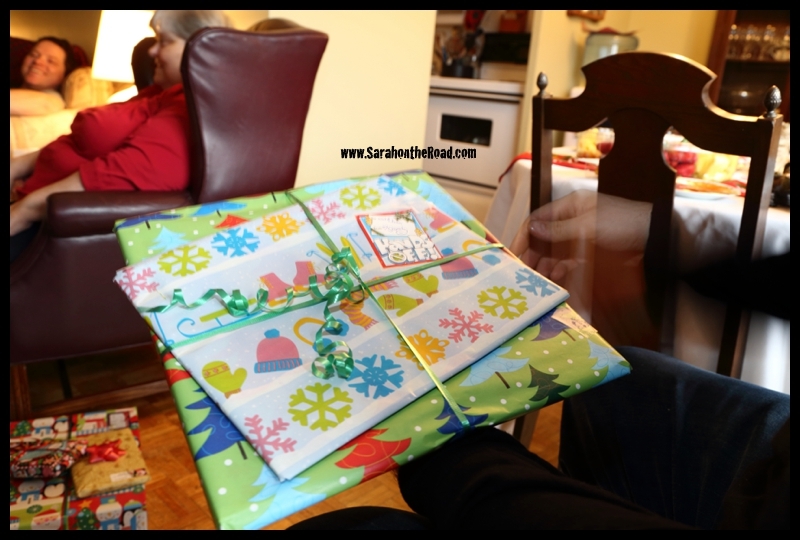 This entry was posted in Christmas, Family, Holidays, Visits to Ontario on December 28, 2014 by Sarah on the Road. Everything’s set at my mum’s house…just waiting for the rest of the family to join, then it will be present craziness for awhile! Love, joy and peace are the ingredients for a wonderful Christmas. Hope you find them all this Christmas. 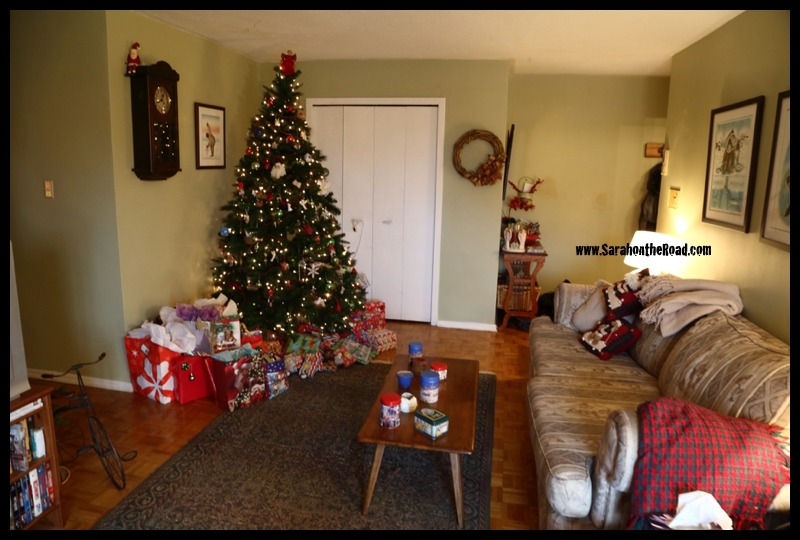 This entry was posted in Christmas, Family, Holidays, Visits to Ontario on December 25, 2014 by Sarah on the Road. Well today is my second day of holidays! Friday night I left Pang on the evening flight after work. I think it was the first time that I had packed and cleaned my house for my house sitter….and finished it all about 5 hours before my flight (during my lunch break from work)! 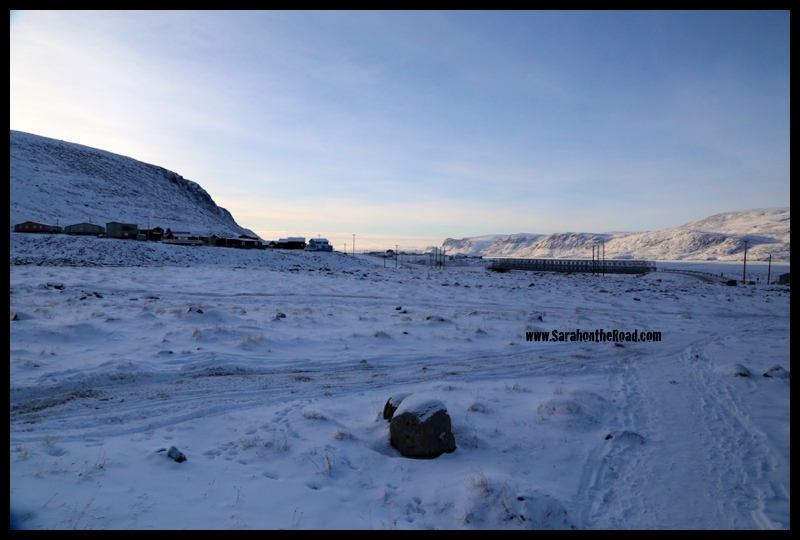 I spent the night in Iqaluit with my friends and their two boys. I love these two so much, they are such fun ages. It was just a short visit but a good one! Taking off in Iqaluit the wind was blowing the snow across the runway. 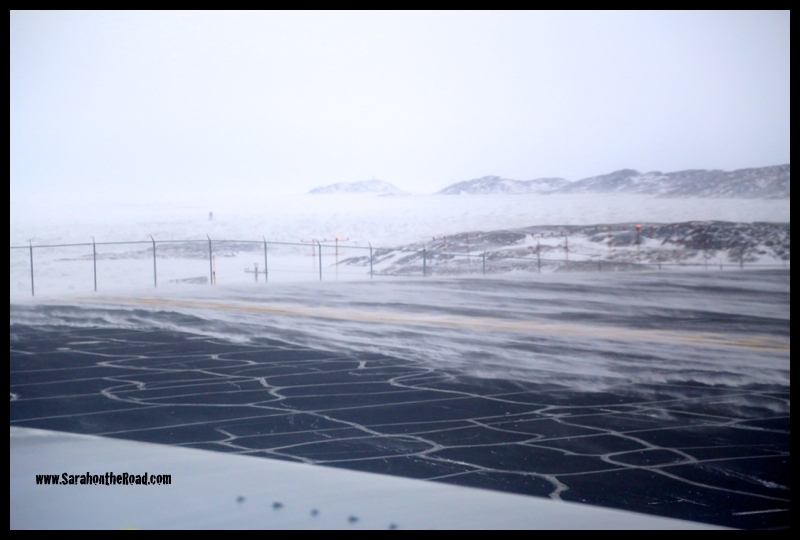 There’s something about Iqaluit that the snow always blows just across the runway. On my flight I bumped into one of my favourite flight attendants…I met her on my trek to Yellowknife last spring when I was trying to get home to Pang from Ottawa. It’s always fun to run into a familiar face…she also was working on the flight that I came north on last November. I love how the north is such a small community and you can get to know your flight attendants and crew. It’s been a great few days to start my holidays here in the south. Sunday I went over to my brother and sis-in-laws to visit their new house in Newmarket. Then last night I went over to have dinner at my Gramma’s house. It was nice to visit her and Bart. 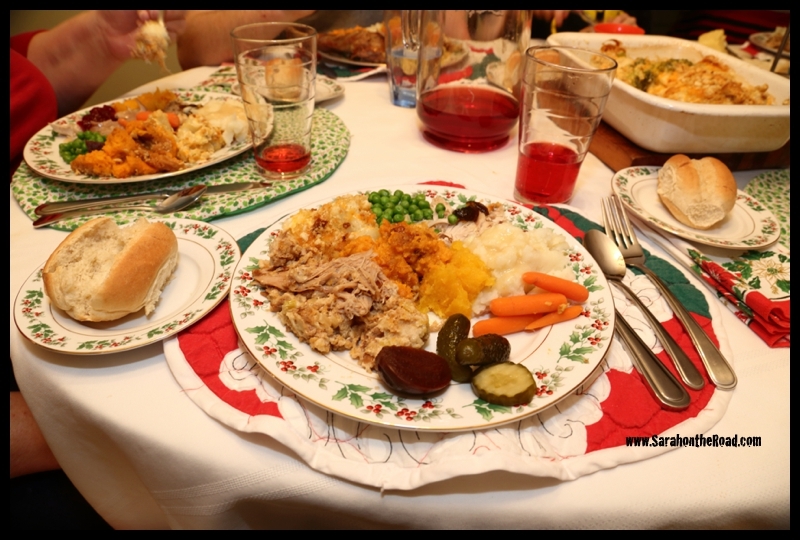 It was nice to be treated to two awesome home cooked meals and to some family dinners! On Thursday early morning my mum and I are leaving the country for some fun in the sun! I can’t wait to just lie on the beach, sleep in the shade, read books and drink fruity cocktails. We are heading to San Salvador, El Salvador…I’m looking forward to a holiday. I’m going to be offline over the next few weeks but have asked some blogging friends to stop by Sarah on the Road and share some of their adventures here with my readers! I hope you enjoy them… as much as I did. 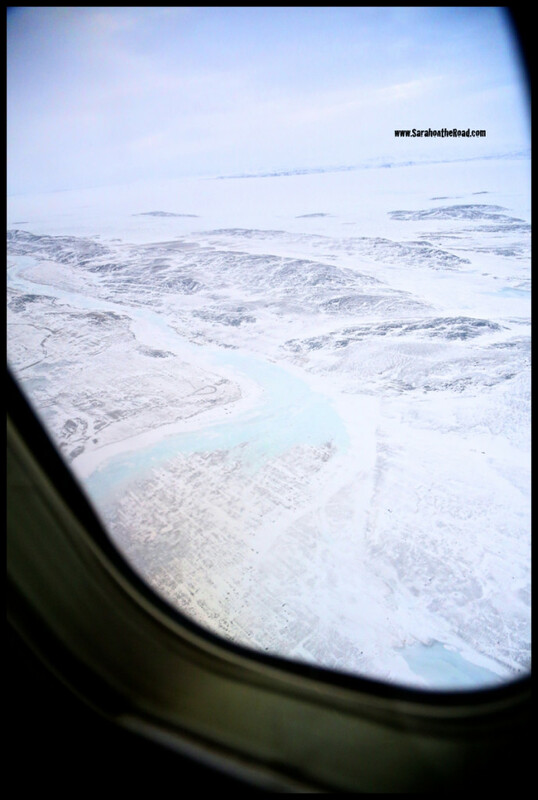 This entry was posted in Travel in Canada, Visits to Ontario on February 11, 2014 by Sarah on the Road. Two weeks ago I was in Toronto at the end of my trip in Ontario…visiting my brother and sister-in-law. It’s funny how much can change in 14 days… to go from ‘late’ fall to ‘middle’ of winter temperature changes! 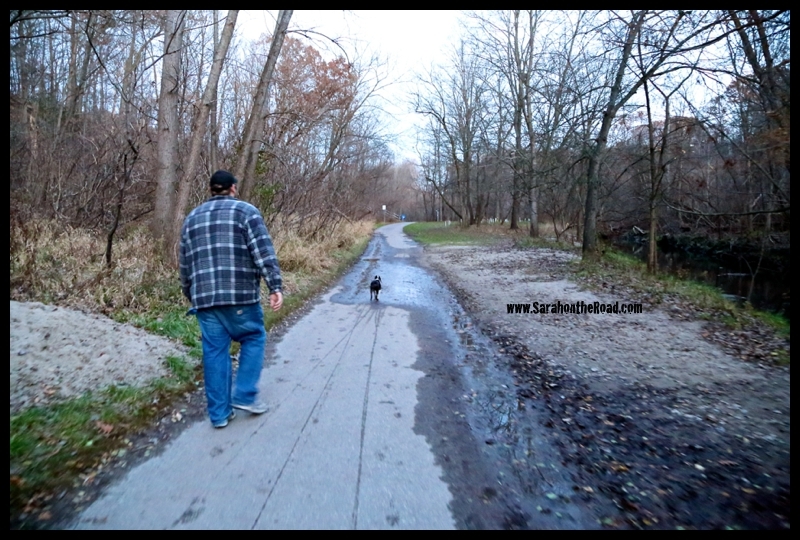 While I was there John asked if I wanted to go for a walk with him and Gus (his dog) in the ravine on part of the Taylor Creek Trail. 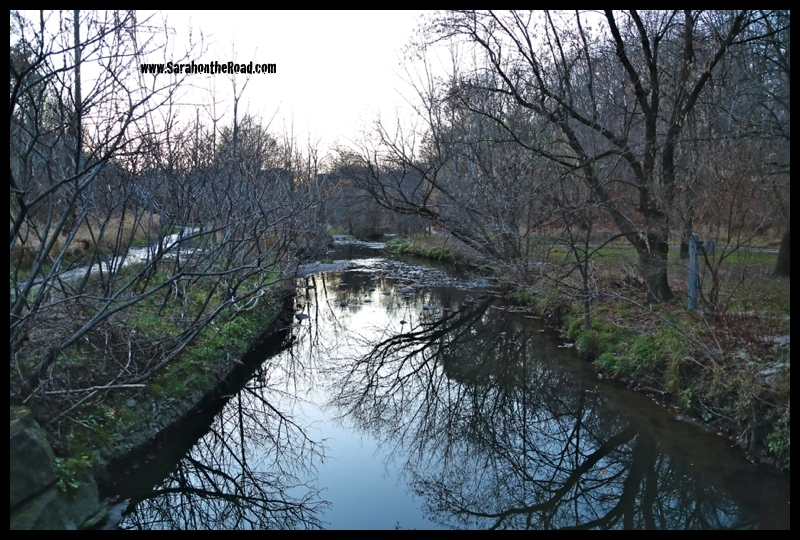 I’d never gone on a walk there…I had my new camera I had been dying to use and get some photos…so I said sure! Plus it’s always great to spend time talking with my little bro. We left around 5pm (I think) the sun had just set. John teased me and said there’s no time for photos…Gus and me we WALK..and he wasn’t joking around…they do walk and pretty darn fast! 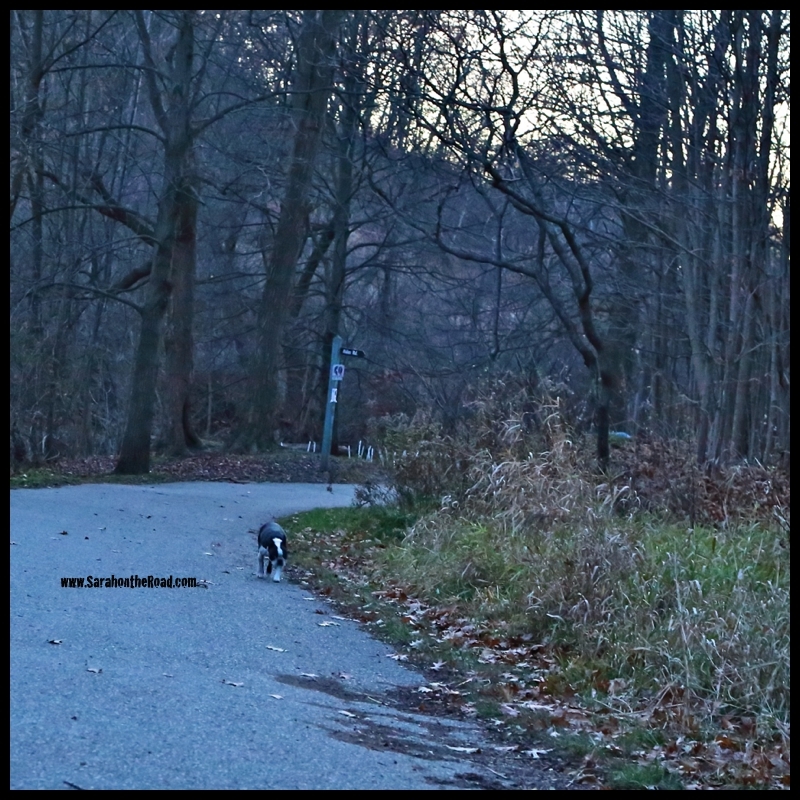 At times it was hard to keep up and I just shrugged it off because John had such long legs…but he and Gus do this walk at least once a day…so they have practice. Me on the other hand, well let’s just say…I’m working on my fitness level…but I like to stop to take a photo once and awhile too! 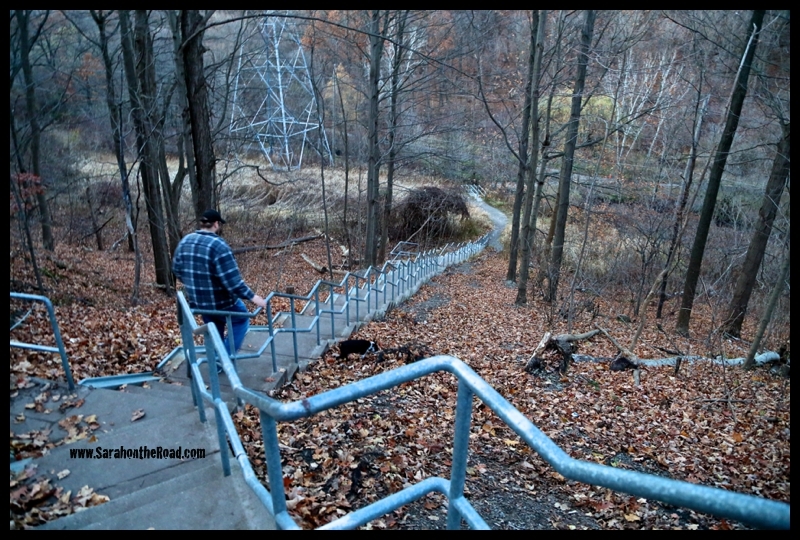 The city of Toronto made really cool ‘access’ points from various neighbourhoods along the ravine path… so that it is easy for people to get down to walk on the path system. Going down the stairs was pretty easy…but going back up, well all I can say is you just take your time and put one foot in front of the other. 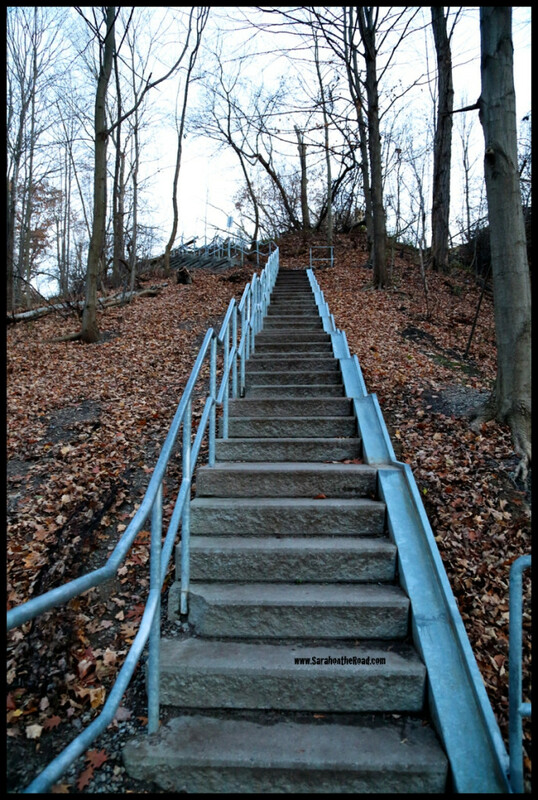 There’s also a fabulous rail on that staircase (on right of photo below) that you can put your bike on so you can push it UP or DOWN that hill… thanks city of Toronto for helping a cyclist out! But the views from walking along the path and the river…so worth going to the trouble of ‘keeping’ up to my little brother! Gus sure enjoys his walks! After the walk John, Kat and I went to an all you can eat sushi restaurant for dinner… my cousin Clayton drove down from Markham to join us. 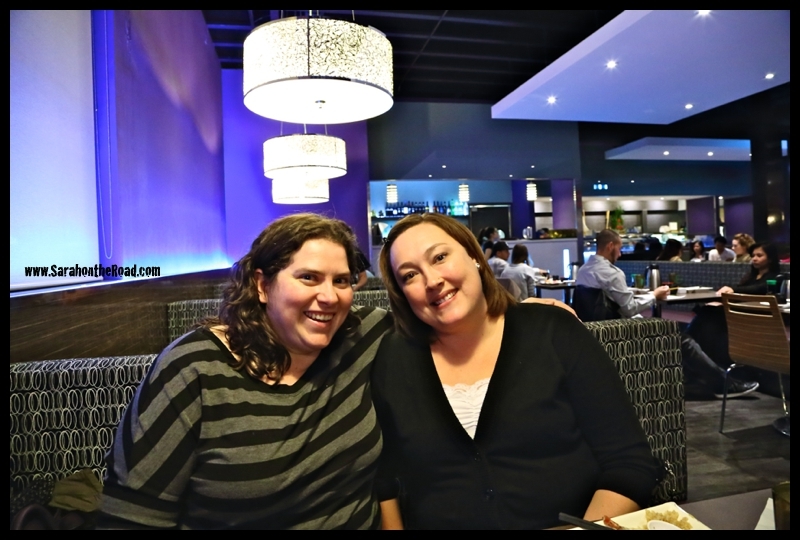 It was a perfect last night in Toronto kind of meal…how can you go wrong with sushi? 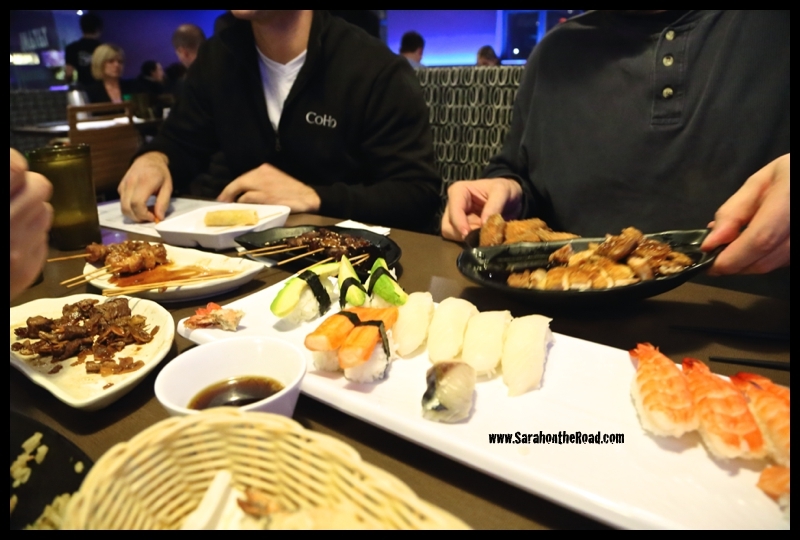 After our bellies were filled with sushi, we walked over to the movie theatre to go see Thor 2: The Dark World… a perfect ending to a perfect day! Thanks for such a great visit…it was so great to be able to spend some time with you. 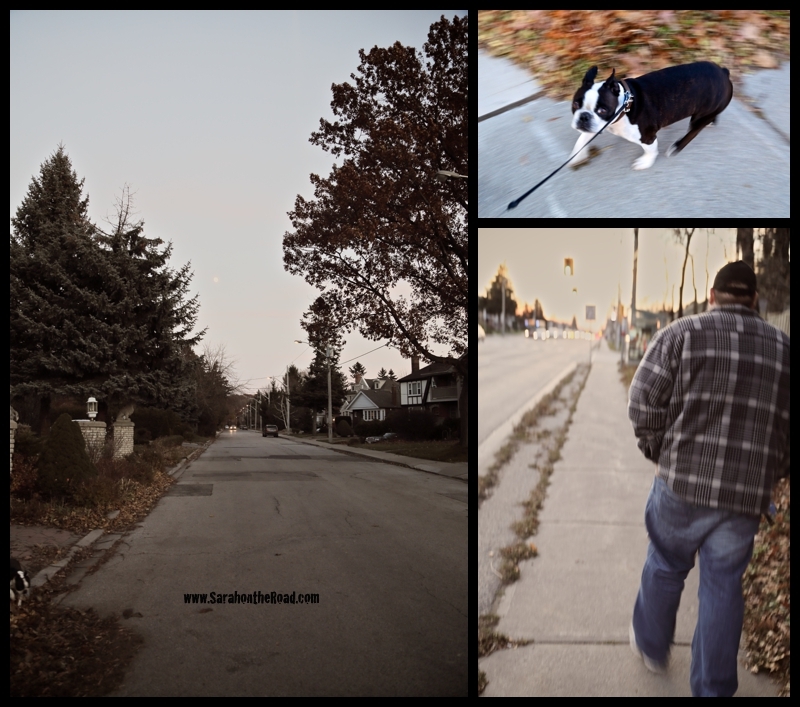 This entry was posted in Family, Visits to Ontario, Walk in the 'hood on November 28, 2013 by Sarah on the Road.